On a vast sand ridge in east Tianshan Mountain in Northwest China, several people wearing red clothes stand out as an impressive ornament to the boring gray skyline. 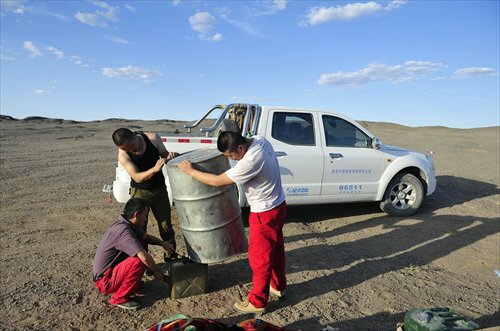 They are surveyors with the Xinjiang Geology and Mineral Exploration and Development Bureau, wrapping up a one-year geochemical survey of a Gobi area of 1,200 square kilometers. The team, consisting of eight technicians and four logistics personnel, has so far trekked to almost every part of the area, which is nearly the size of the landmass of Hong Kong. Every day, they set off from the camp base in trucks with tools like compasses and GPS satellite positioning and navigation systems. Their task is to survey the area's distribution of mineral resources. 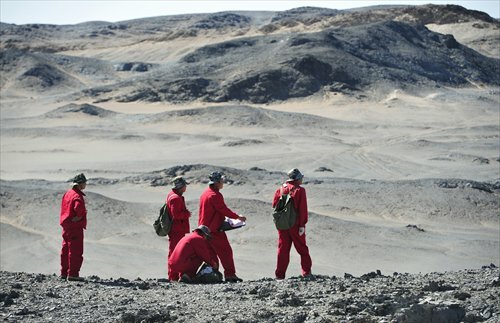 On May 23, their job was to map out the geochemical profile of two 2.2-kilometer-long lines in a fracture zone and collect rock samples. "We define a straight line according to GPS data, collect rock samples every 40 meters on the line, record the information and graph. And we have to get through straight even if there's high mountains ahead," Ma Jun, 34, the oldest member of the team, told the Xinjiang Daily. Ma has worked as a surveyor for eight years. During this time, he encountered bears and wolves, and fell into raging rivers. "Once you choose the job, you must be prepared for hardships." This is a sentence Ma always repeats to his younger teammates. The team leader is Tian Jiaqing, 26. Although he has worked for less than four years, his has travelled across Xinjiang. Each year, he spends nine months surveying. Meng Zhihao, 24, is the youngest member of the team. He has already got used to this isolated life and he believes this job is better than his previous work experiences. He had joined some field surveys in high altitude areas in Tibet and Sichuan, where there was no electricity or communication signals. "But in the camp here, we can receive signals and have generators. I can talk with my parents every day on the phone and watch movies." After the program is completed, they will set off for the next task immediately, to do a prospective survey of tungsten and tin ore in another region. According to media reports, China is decreasing its investment in mineral exploration because global demand has dropped in recent years. 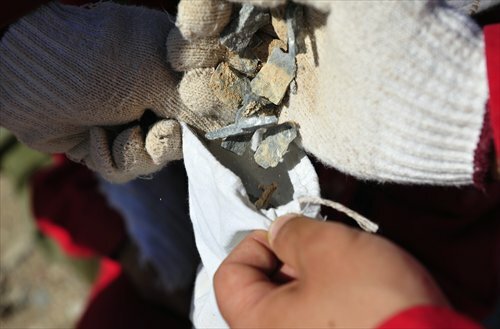 Official statistics show the country invested a total of 112 billion yuan ($18 billion) in mineral exploration last year, 8 percent less than in 2013. In 2014, the newly identified mineral reserves included 3 billion tons of iron ore, 4.42 million tons of copper, 210 million tons of bauxite and 841 tons of gold.